With the few chickens I have, I always have enough eggs to meet our needs and extra that I have to figure out how to use. We have a lot of boiled eggs for lunches and, believe it or not, you can have omelets so often that even fixed up with ham and cheese, they just no longer sound very appetizing. During the summers when I was growing up my cousin would stay with us every day. My mom would throw together egg salad sandwiches and “iced” tea and tell all of us kids that we needed to eat them outside on the picnic table. The egg salad and tea would be warm because she had just made them and combined with the Florida summer heat…well, let’s just say that this was my least favorite meal. My kids have had it once or twice and that was enough for them to decide that they don’t like it either. 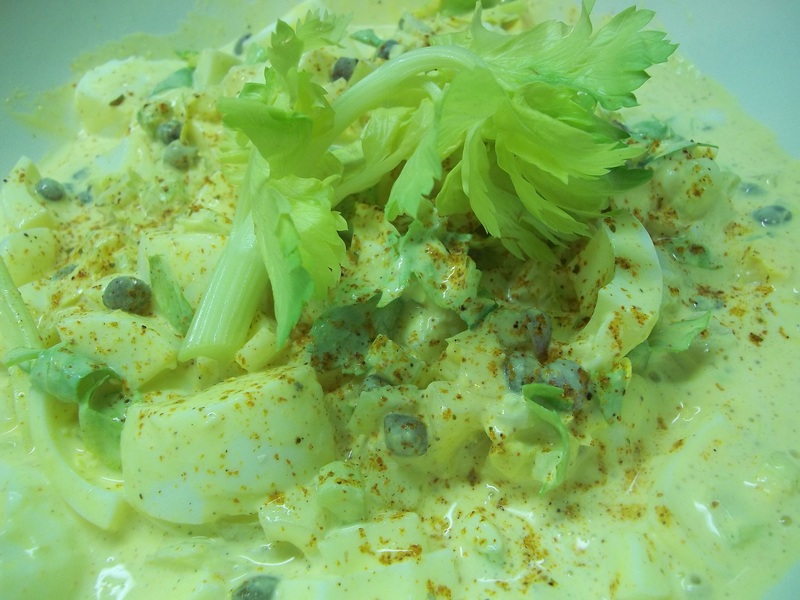 When I came across a curried egg salad recipe, I instantly thought of the “luxury item” I had put in the shopping cart a couple of months before, red curry powder. The capers that were left from another long ago shopping trip were an afterthought. I wondered if even egg salad could be improved with a couple of interesting ingredients so I gave it a shot. As it turns out, I think if it had been the first time I had ever had egg salad I would have liked it, but since I already had an aversion to the texture I still had trouble getting it down. I love the crunch of celery in salads so that was my favorite part. Looks great to me. But I appreciate you honesty. Ha ha. Thanks. I guess you have to like it to begin with.